Kick off the new year with the best events, sights to see and places to explore in January. Photo By: Elvis Presley Enterprises, Inc.
Photo By: Kenny Karst/DNC Parks & Resorts at Yosemite, Inc. There are many organized New Year’s plunges, but the original is in Coney Island, New York. The annual Coney Island Plunge is organized by the Coney Island Polar Bear Club, the oldest ice swimming club in the U.S. The yearly dip into the Atlantic begins at 1 pm sharp; afterward, if you’re still breathing, check out the famous Coney Island Boardwalk. Hob-knob with some of the movie industries biggest movers and shakers at one of the largest film festivals in North America. With over 135,000 attendees each year, the two-week long Palm Springs festival includes new and celebrated international features and documentaries. The festival is also known for its annual Film Awards Gala, honoring the best achievements of the year by a celebrated list of talents. High-five! Kick off the New Year at the 25th annual Walt Disney World Marathon. For the super-fit, a 26.2-mile course runs through all four Walt Disney World Theme Parks. If you’re not up for the full marathon, do the half-marathon, 5K or 10K course. In its 33rd year, this music festival continues to draw thousands of people to Colorado who love skiing and music. The six-day festival features 50+ bands and live performances of Americana music. If you can’t secure tickets to some of the top-name performers, there are free concerts at Gondola Square. In between shows hit the slopes, go for a snowmobile tour or a dog sled ride, soak in the hot springs or try a flight in a hot air balloon. Many cities around the world celebrate the Feast of the Epiphany or Three Kings’ Day on the 12th day of Christmas. The celebration marks the day on the Christian calendar when the Magi brought gifts to the baby Jesus. Parade, performances and feasts are all part of the tradition. New York and Miami hold big parades as well as many cities in Mexico, Spain and other parts of Latin American and Europe. No matter which celebration you go to, be sure to get some rosca de reyes; it’s a sweet bread baked in a ring shape to represent a crown and decorated with candied fruit to represent the jewels. Aruba doesn’t wait until a few days before lent to party, they start in early January. The Aruba Carnival is a month-long celebration filled with music (lots of steel drums), dance contests, jump-ups (they’re like street parties), parades, and warm-up parties that promote local beer. Oh, and let’s not forget Aruba’s gorgeous beaches! The Metropolitan Museum of Art in New York City is exhibiting nearly 50 marbles, bronzes, plasters, and terra cottas by Auguste Rodin. The exhibition features iconic sculptures such as The Thinker and The Hand of God, as well as masterpieces such as The Tempest. If you’re looking for a more kid-friendly activity, check out The New York Botanical Garden Holiday Train Show. The beautifully lit exhibition features more than 25 G-scale model trains and trolleys zipping over a quarter mile of track. The elaborate displays are made up of moss, twigs and leaves. The trains chug around 150 New York City landmarks, each one painstakingly reconstructed using natural materials. Classic visitor favorites include Grand Central Station, Yankee Stadium, Empire State Building and the Statue of Liberty. Both these exhibits will be gone by January 15. On Jan. 8, 1935, Elvis Presley was born in a two-room house in Tupelo, Miss. Every year, Graceland — Elvis' estate in Memphis — hosts a five-day-long birthday celebration. Rise bright and early for the Elvis Birthday Proclamation Ceremony on Graceland’s North Lawn, and stay for the birthday-cake cutting. You don’t have to be a tech geek or even be in the tech business to go to the Consumer Electronics Show (CES). For four days in January, Las Vegas becomes the gathering place for all things consumer technology. It often serves as the proving ground and the place to unveil the latest and greatest breakthroughs in high tech. Take In Some Art in L.A. The Los Angeles Art Show is the longest running venue for contemporary, modern, historic and traditional art in the country. With more than 200,000 square feet there's something for everyone, but the show is broadly divided into sections — modern, contemporary and traditional — to make it easy to find what suits your tastes. Raise a toast to winter in Aspen’s annual Winterskol Festival. The winter tradition is more than 60 years strong and was started by a lodge owner who wanted to enliven the Aspen winter season following Christmas. Today, the four-day winter fest includes a snow sculpture competition, a soup cook-off and a downhill race with apple strudel at the finish line. Ice carving in Northeast China is said to have developed back to the Qing dynasty when fishermen would pull ice from the Songhua River to carve into lanterns. All those years of experience evolved into the epic Harbin International Ice & Snow Festival, with artists and sculptors competing to create the largest, most extravagant and intricately detailed structures. Attracting 10 to 15 million visitors a year, entire buildings are recreated in frozen form to make a city of ice. The sculptures are life-size versions of famous buildings, structures and characters, all created by master sculptors and artists. Observe the sculptures during the day, and engage in other optional activities such as sledding, ice hockey and ice mini golf. Revisit the festival at night, when the ice is lit up with colorful lights. The Canadian Rockies is the place for adventure in January. Besides the predictable winter activities — skiing, shoe-shoeing, skating — Jasper in January hosts fat bike snow races, sleigh riding, dog sledding and ice climbing. And that’s just during the day, Jasper’s evenings offer wine and whiskey tasting, food-a-paloolza, live music, entertainment, kids’ scavenger hunts, plus stargazing and northern-light viewing with s’mores. Also known as the North American International Auto Show (NAIAS), this annual auto show is among the largest car shows in the world and no doubt the most popular. From high-performance muscle cars to self-driving cars, NAIAS has something for everyone. The show is traditionally where automakers reveal their new designs and introduce the latest technologies, so you’ll get a sneak peek at the vehicles you may be driving in the future. Celebrate the life of the civil rights leader during the MLK Day of Service. In honor of Martin Luther King, Jr., hundreds of nonprofits and volunteer centers nationwide observe the federal holiday, named in King’s honor back in 1983, as a day of giving back to local communities and shelters. Grab a hammer and lend a hand. The Blues Foundation presents the 32nd International Blues Challenge, the world's largest gathering of blues acts. The clubs up and down Beale Street are filled with a variety acts as they compete for cash, prizes and industry recognition. The quarter-finals take place throughout the clubs on Beale Street and then the finals held at the Orpheum Theatre. There are several locations with accommodations made of ice, Norway, Quebec, Alaska and Sweden to name a few. This is the IceHotel located in Jukkasjarvi Sweden; it is 200 km north of the Arctic Circle and is open year-round. Regardless of the temperature outside, the air in the Icehotel is always between 17 and 23 degrees Fahrenheit. The bedrooms have blocks of ice as beds, covered with fur, skin, hides and sleeping bags so you’ll stay toasty warm. The Sundance Film Festival is a 10-day event held every January in Park City, Utah. Get your tickets early, many of 100+ screenings sell out in advance. This very popular festival showcases independent movies from all over the world. Named for Robert Redford's character in Butch Cassidy and the Sundance Kid, the festival has seen Redford play an integral part in building the festival's status over the years. If ice hockey is not rough enough for you, go see an ice cross competition. The Red Bull Crashed Ice in St. Paul, Minn. is like roller derby but going downhill with sharp turns. The competitors race down a 1,600-foot-long frozen track that drops 12 stories with hairpin turns all along the way. To succeed in this extreme sport, competitors need a serious background in speed, slopes, head-to-head battles and agility. The event draws about 120,000 spectators so get there early to get a good spot. Celebrate National Cheese Lovers Day by throwing away your New Year’s resolution and enjoying a comforting bowl of mac 'n cheese. 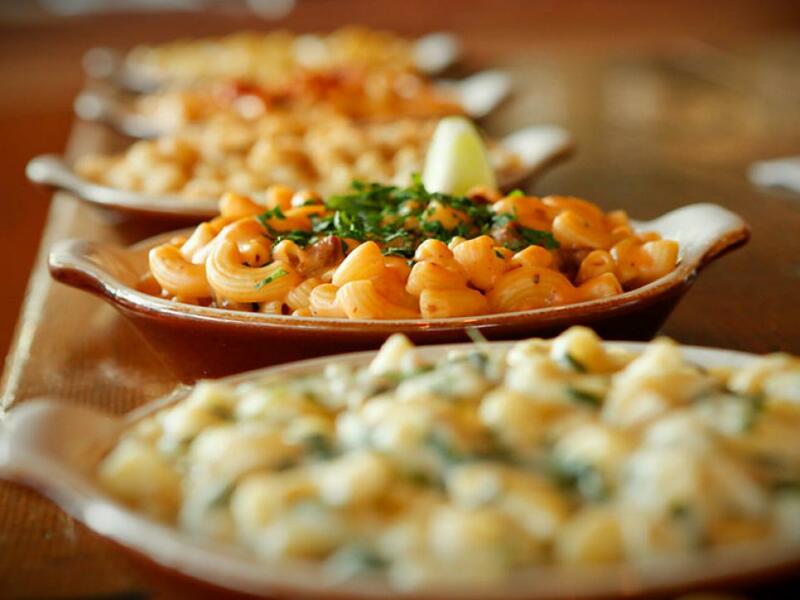 Check out one of these five restaurants that specialize in cheesy pasta goodness. Mendocino County, California is home to a lot of fishermen, grape growers, winemakers and brewmasters. This 10-day countywide festival is a celebration of all their efforts. It takes place in the middle of the long winter season when things are a little bit slower, allowing more time to partake in fine seafood, wine and beer. There’s so much to see at the Museum of Popular Culture (MoPop), it’s hard to pick just one exhibit to talk about. But, if you’re a Trekkie, you must make the pilgrimage to see 100+ artifacts and props from the five Star Trek television series, spin-offs and films. The most noteworthy part of the exhibit is Captain Kirk’s command chair and the navigation console which is on display for the first time to the public! If seeing the bridge of the Enterprise isn’t your thing, you’ll likely find something to pique your interests like the Jim Henson exhibit, a collection of David Bowie photos, a gallery of horror movie villains or the "We Are 12" Seattle Seahawks exhibit. Also, don’t forget to enter Travel Channel’s Ultimate Seattle Trip Sweepstakes. Take a tour of the Majestic Yosemite Hotel, the grand Yosemite National Park hotel that has hosted its share of famous guests through the years, from Walt Disney to Queen Elizabeth II. Visit this January for the annual cooking event, A Taste of Yosemite and embark on a Northern California culinary adventure. Ditch the winter boots and grab your summer flip-flops. Escape the winter cold at this ninth annual foodie festival. Savor fresh Florida Keys seafood, fine wines from around the world, and the laid-back tropical vibe of the island that bears the festival’s name. Robert Burns (1759 — 1796) is thought of (but not officially named) Scotland’s national poet. Every January 25, Scots and British celebrate his life and poetry with formal dinners where guests recite Burns work and dance to his lyrics. The dinners usually consist of several courses including a whisky course and a plate of haggis. Australia Day is an official holiday throughout the entire country. It marks the anniversary of the 1788 arrival of the First Fleet of British ships at Port Jackson, New South Wales and the raising of the Flag of Great Britain at Sydney Cove. With community festivals, concerts and citizenship ceremonies, the day is celebrated in small towns and big cities around the nation. Probably one of the longest running festivals, the Carnival of Venice (Carnevale di Venezia) is said to date back to 1162. The festival is world famous for its amazing and unique masks that people wear during this event. The carnival’s grand opening and the main event is January 27 and 28, but the carnival runs through Ash Wednesday on February 13. Venetians adorn their boats with colorful decor and parade up and down the Grand Canal. There are also competitions for the best masks and costumes, plus all sorts of entertainment and music. The Brainerd Jaycees Ice Fishing Extravaganza draws over 10,000 anglers annually who compete for more than $150,000 in prizes. All proceeds from the event are donated to local charities. The Low-Country Oyster Festival is located in Mount Pleasant, South Carolina, just outside of Charleston. The 35th annual event — held at the Boone Hall Plantation — serves up over 80,000 oysters. Besides the tasty fare, the festival includes an oyster shucking contest, oyster-eating contest, live music and lots of beer to wash it all down. The traditional festival of fire known as "Up Helly Aa" takes place annually on the last Tuesday of January in Shetland, UK. Participants in full costume haul a Viking longboat through the streets as paraders throw flaming torches into the galley. Puerto Rico was one of the hardest hit islands by the recent hurricanes, and many parts are still without water or electricity. But that doesn’t mean you should avoid the entire island, and visitors can help by bringing needed supplies. San Juan is slowly getting back to business and many hotels are accepting reservations. They’re also offering voluntourism programs, like rebuilding local farms and raising funds for Puerto Rico Rising. See Puerto Rico lists resources for voluntourism trips beyond San Juan. Travelers can help clean beaches or assist with water filtration through Local Guest and Waves for Water.